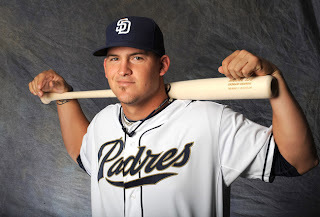 The San Diego Padres announced reassigning Yasmani Grandal today to AAA Tucson. yet the consistent knock on him is his defense. Grandal is better served playing everyday in Tucson and working on his handling of the pitching staff and overall defense than he is sitting on the Padres bench watching Nick Hundley play. Baker is here on a one-year deal. 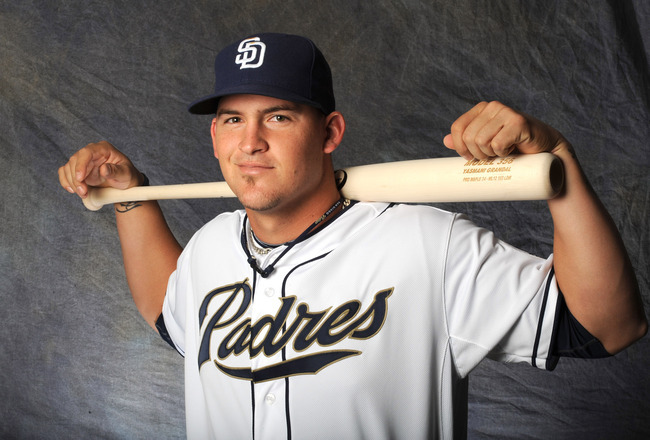 If Grandal continues to develop this year I doubt the Padres will bring Baker back for 2013. The Padres also re-assigned Alex Hinshaw to minor league camp. Last Season: Padres finished last in the NL West, 23 games back of Arizona. If not for the Houston Astros, San Diego would have tied the Chicago Cubs for worst record in the National League. The club lost 17 of its first 27 games and never recovered. The Rotation: The 2012 Padre rotation projects to be Tim Stauffer, Corey Luebke, Edison Volquez, Clayton Richard, and Dustin Moseley. On paper it looks like a decent rotation, but there are a lot of question marks with this group. Both Richard and Moseley are returning from season-ending injuries that required surgery. Richard is reported on-track after arthroscopic surgery to his left shoulder; his effectiveness during spring training is something to closely watch. Moseley also had surgery on his left shoulder, but at least it was his non-throwing shoulder. Moseley dislocated it twice last season while swinging the bat, so don’t expect a lot of ferocious hacks from him this year. Edison Volquez, the newcomer obtained in the Mat Latos trade, had Tommy John surgery in 2009. In the three years since, he has not approached his 2008 campaign (138 ERA+). Volquez will benefit from pitching in Petco and should approach his 2008 numbers. The stalwarts will be Stauffer and Luebke. Stauffer is expected to be the ace of the rotation, and has had flashes of brilliance during the last 2 seasons. He will have learned from the fatigue that plagued him last summer. Luebke gives the Padres 2 lefties in the rotation, and will look to build on a 2011 that saw him be the best starter (by ERA+) in the rotation. This is Luebke’s breakout season; he will be very good. Starting Pitching in the Organization: The Padres are loaded, having recently been rated the best farm system in baseball by ESPN. Both RHP Casey Kelly and LHP Robbie Erlin are legitimate ML prospects that could be in the majors in less than 2 years. San Diego has developed a habit of keeping their elite prospects in AA San Antonio rather than AAA Tucson, because there is so much offense in the PCL (lots of small ballparks at altitude). The Padres also signed journeyman Jeff Suppan to a minor league contract, giving them a veteran arm should they need a spot start – highly likely given that 40% of the projected rotation had surgery last season. The Bullpen: San Diego signed free agent Huston Street to be the closer, replacing Heath Bell who signed with Miami. The Padre bullpen has been a strength for years but this is the biggest reconstruction effort they’ve undertaken since the middle of the last decade. Andrew Cashner, acquired in the Anthony Rizzo trade, projects to be the set-up man but could also move into the rotation. He hit 103.3 on the gun during his first spring training appearance. The gun was likely off a couple of MPH, but he’s still throwing high 90s heat. Dependable Luke Gregerson will man the seventh inning and has the chops to pitch in the eighth (or ninth) if needed. San Diego’s LOOGY will be Joe Thatcher, who has fought injuries the past 2 years but seems fully healthy now. The man to watch in this bullpen is Ernesto Frieri. Frieri has the stuff to close, but has yet to pull it all together consistently. If he can do that, the lights-out ‘pen of 2010 will return this season. The Corners: Chase Headley returns for a fifth season at third, and off the best offensive season of his career. He should reprise that production in 2012. That’s the easy corner. First base is a lot more complicated. Currently San Diego has four men on the 40-man roster who can play first – Yonder Alonso, Jesus Guzman, Mark Kotsay, and Kyle Blanks. Based on his 2011 Guzman has to be the incumbent and favorite, however Alonso projects to be the long-term answer at first and Blanks’ power remains alluring on a team starved for a thumper. Kotsay will spot-start throughout the year. Up the Middle: Jason Bartlett and Orlando Hudson return for a second season by the bay. Both can’t help but improve from their 2011 effort. Look for Bartlett to play better defense the first half of the season than he did last year, and Hudson to stay off the DL. Offensively Bartlett is what he is, especially in spacious Petco, but Hudson should see his batting average and on-base percentage rebound closer to his career averages. The Outfield: The Padres signed budding star Cameron Maybin to a 5 year deal, so he will man center for the foreseeable future. Carlos Quentin, a San Diego native, signed a one-year deal with the club and will patrol LF after he returns from right knee surgery to fix a torn meniscus. Quentin’s power projects well at Petco; 25 HR is not outside the realm of possibility. Will Venable will likely patrol RF this season. Venable is a plus defender athletic enough to cover Petco’s spacious right field, but he is hit and miss at the plate. He seems to have connected with new hitting coach Phil Plantier, so perhaps he will finally tap all his potential. 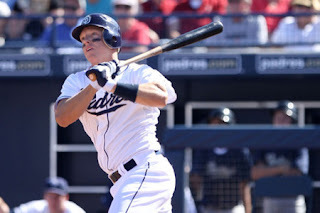 The Backstop: Nick Hundley finally broke out during the second half of 2011 and should build on that production in 2012. If he falters the Padres are loaded behind the plate. John Baker was acquired from Miami in the off-season and will be the back-up. On the farm, Yasmani Grandal was also acquired in the Latos trade. The Cuban emigre has a major-league ready bat but needs additional seasoning defensively. He should begin the season in AAA. Top prospect Austin Hedges was the best defensive catcher available in last year’s draft; although his offense needs additional seasoning and maturity, he’s ready today to call games at the ML level. The Bench: The aforementioned Kotsay brings a left-handed bat to the bench and some veteran leadership to the team. Chris Denorfia, the team’s fourth outfielder, will see a lot of playing time in the lineup via the spot start and late inning defensive replacement, and is also a dependable right-handed bat off the bench. Back-up infielders are still being figured out. It is likely from a pool including Andy Parrino, James Darnell, and Everth Cabrera. Logan Forsythe was in the mix until breaking his foot early in spring training. The Minors: Suppan will make at least 2 starts for the Padres. Third Baseman Jedd Gyorko is a highly touted prospect who is almost ready. Should the projected bench players falter Gyorko could spend a lot of time with the big club. He will eventually replace Headley at third. Team’s 2012 finish in the division: fifth. Quentin is known for his work ethic. That, coupled with his pull-power to left, the most neutral of the fields for hitters at Petco, means he should put up the numbers he is accustomed to. Quentin’s presence in the lineup alone should help the Padres win 4 more games than last season. Tim Stauffer is currently the team’s ace, but Luebke showed flashes of Mat Latos-like brilliance during 2011. He breaks out and becomes a house-hold name this season. Heck even if he just repeats the numbers he put up last year he’s the best pitcher on the staff. The NL West is an interesting division. San Francisco is a year removed from being World Champs, and Arizona went from worst to first in 2011. The Dodgers, under stable leadership, should compete with those two teams, and Colorado should be better than last year. The Padres will improve but will once again inhabit the basement of this division. Challenging for the division title is still 2 years away. When the Padres traded for Quentin this winter they filled a glaring need for a power bat in the lineup. Carlos' power is legit, and his specific pull power to left will translate well at Petco National Park. With this deal the team also further exacerbated their organizational depth problem at two positions. It's not a lack of depth; it's too much depth. Because Petco is so big it was immediately assumed Quentin would man left field. Left was already a toss-up between Kyle Blanks, Jesus Guzman, and possibly Mark Kotsay; adding Quentin ended that discussion but now what do you do with Blanks and Guzman? Both men can also play first. The log-jam there was almost worse than in left. They as well as Kotsay can play first, but it is much more likely Yonder Alonso (acquired in the Latos trade) will be the everyday first baseman in 2012, which returns us to the original problem of where to play Guzman and Banks. Now normally this would not be an issue. Blanks is 24 and still trying to recover his stroke from 2011 elbow surgery. He also struggles to hit a pitch at the knees on the outside corner. Guzman is a journeyman in the classic sense of the word, so if he got kicked to the bench no big deal, right? Except Jesus Guzman was the Padres best power hitter in 2011 (by OPS+). Over the last couple of years the Padres offense has struggled to say the least. Can you imagine a scenario where one of the team's best hitters is consigned to a bench role? Has that ever happened before? Closest I could come up with was Rod Carew being let go by the Angels the winter after he got his 3000th hit. Is there a way to get Guzman into the everyday lineup? Yeah. Refer to the quote at the top of the article. The Padres could start Guzman in left and Quentin in right. That would guarantee their best lineup gets the most playing time. Win, right? We ride off into the sunset and make the playoffs? Well, um, no. It is pretty clear the team would score more runs. Some combination of Guzman/Quentin/Alonso/Cameron Maybin/Nick Hundley in the middle of the order would make the Padres dangerous. However they might give up as many runs as they put up. First Guzman has virtually no experience in the outfield at the Major League level. In his career he has 51 innings anywhere in the OF, 47 of those innings coming in left; all that experience happened last season. One can't responsibly draw any conclusions on his defensive prowess based on 51 innings. He at least looked competent last year - he didn't have a ball bounce off his head and go for a Home Run, so that's something - but in those 47 innings in LF Dewan plus/minus ranked him as a -1 defensively. Quentin's defensive metrics are all over the map. In LF he was downright awful, ranking 25th in 2010 (1147 innings in LF and his defense allowed more runs to score than would have normally), and 33rd in 2011 (753 innings, 11 runs allowed). In right he's alternated between middle of the road (2009, AZ, 577 innings, 2 runs saved, ranked 15th), to downright awful (2010, CWS, 897 innings, 14 runs allowed, ranked 35th), to pretty darn good (2011, CWS, 854 2/3 innings, 6 runs saved, ranked 6th). Could he competently cover RF? Probably. The hesitancy is due to not only his recent arthroscopic surgery to his right knee/meniscus, but because of how large Petco Right Field is. A guy on 2 good knees is challenged to cover all that real estate. Then what does the team do with Will Venable? Venable is an elite defender in right. He's been a top 6 defender out there in 2 of his three years with the Padres, and middle of the road the lone year he wasn't. Venable has been spectacularly average at the plate (103 career OPS+), however, which is why making him a late-inning defensive replacement has some allure. Venable has torn it up this spring (.372/.440/.512 through yesterday's games), which would support reports he has really connected with new hitting coach Phil Plantier and become the hitter all hoped he would be. It also further complicates the defensive picture in the OF. For the first 2 weeks of this season this question is moot. Quentin won't return to the active roster until mid- to late-May as he recovers from his surgery, so Venable will be the starter in right and Guzman should get the majority of the starts in left. Once Quentin returns, the problem resurfaces. How do you get Guzman's bat into the lineup everyday? San Diego might be alone among NL teams wishing the DH was already in force for the senior circuit. The Padres announced earlier today they had re-assigned 4 players to minor league camp and one to AA San Antonio. RHP Miles Mikolas and Matt Painter, INF Jedd Gyorko and OF Jaff Decker were sent to ML camp. INF Jeudy Valdez went to AA San Antonio. The Padres team press announcement noted this leaves 41 players in camp, of which 10 are non-roster invitees, one of whom is Jeff Suppan. I may be the only Padre blogger hoping Suppan makes this team. Of course, those roster moves are dwarfed by the intrigue surrounding club ownership. In the latest development of what has rapidly turned into a soap opera, Padres CEO and apparent heir to ownership Jeff Moorad stepped down as CEO. It was initially reported Moorad had accepted a VP position with the club and that VP Tom Garfinkel had been elevated to CEO. Later reporting indicated Moorad had cleaned out his office entirely and was gone. That's not the end of the intrigue. John Moores, who was compelled to sell the team as a result of his divorce proceedings, has been reported to having renewed interest in steering the club. If that happens does he undo all that Moorad's team did, especially in the front office? Moorad cleaned house, bringing in a new GM, revamping and expanding the scouting department, expanding the sales force. His changes have paid off in that the Padres now boast a top 5 farm system (#1 according to ESPN's Keith Law). One would hope Moores is a savvy enough businessman to see these changes have largely been for the better of the Padres franchise. What does Moorad's step-down mean for his ownership group? One would think that whatever objections exist to Moorad's ownership, they would not be removed simply because Moorad's no longer the front man. My guess is the objections are serious enough they want him to have no part of the team which finally buys the club from Moores. It stinks from Jeff's perspective, in that he and his ownership group have sunk roughly $200M into the franchise trying to buy it and that dream won't be realized. Yesterday the San Diego Padres extended catcher Nick Hundley through the 2014 season. The contract also includes a club option for 2015. You know how hard it is to find a picture of Nick with a bat? The dollar values for each year are incredibly cost-effective for the Padres. Hundley will make $2M this year, $3M next, $4M in 2014, and could make $5M in 2015 if the club wants him to stick around. They also mean Hundley undersold himself by quite a bit. Even though his WAR hadn't been that good prior to last season, he'd still been worth more money per year than he'll make in each the first 2 years of this contract, even in the medicore years (2008-2010). Assuming his .367/.404/.656 performance after 12 August signifies a real breakout by Hundley (it is unrealistic to expect he'll hit like that over the course of a full season, but somewhere in the .260-.280 range for AVG shouldn't be) he left even MORE money on the table. Not to mention his offensive numbers are depressed by Petco. And, he's a servicable defender. According to the Fielding Bible, he was middle-of-the-road in terms of CERA and runs saved (ranked 18th), but in the top 1/3 of the league in preventing stolen bases with a 30% caught stealing rate (good enough for 8th). So no, I don't know why he settled. Dave Cameron at Fangraphs advances a possible reason why the Padres priced him as they did. There could be another two reasons why the Padres locked him up for 3 years, but insisted on a club option only for 2015, and those reasons are Yasmani Grandal and Austin Hedges. Hundley is good, but both of these guys project to be better. Each has half of the package - Grandal can hit a ton but is a work in progress behind the plate; Hedges is almost the exact opposite. If you could synthesize the two into Ausmani Grandges, San Diego would have the best catcher this side of Johnny Bench, but sadly that type of cloning technology is still several years away. This deal gives each player 2-3 years to fix their weaknesses before becoming the back-up catcher to Hundley and then the full-time receiver in 2015/2016. It also means that, assuming one of them does supplant Hundley as the primary catcher between now and 2015, the Padres could bring Nick back as the back-up for a reasonable cost. That might be the best option for Hundley, who will be 31 in 2015 and likely not to get a big payout on the free agent market. You know Carlos Quentin had surgery yesterday to repair a torn meniscus and clear out some loose cartilage on his right knee. 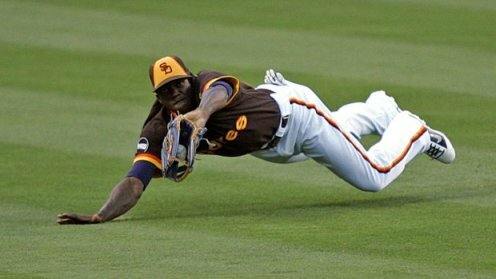 The Padres reported the surgery occurred at the Scripps Clinic Carmel Valley, and that the plan is he will return to playing in 4-6 weeks. Let's do a little tea-reading here. No one has reported where specifically Quentin's meniscus tore or how serious it was. We do know he tweaked his knee on 9 Mar and played through it for a week before deciding on the surgery. 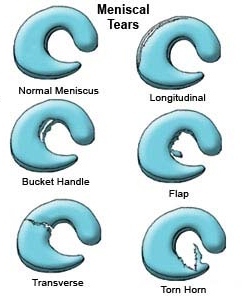 My detailed medical knowledge, culled from a single Google search on meniscus tears, can be summarized in this web link. What is a meniscus? It's the shock absorber between your leg bones that meet at the knee joint so they don't rub together. 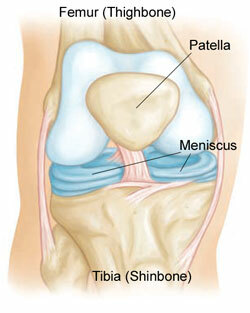 I actually slipped my meniscus once while playing volleyball, causing the two bones to rub briefly against each other. It is not a pleasant sensation. So where did Quentin tear his meniscus? Longitudinal tears can heal themselves over time since that part of the meniscus has good blood flow; surgery usually is not required. Based on the description of the procedure (trimming the tear) we can rule out transverse as well. I think it most likely he had a flap or torn horn kind of injury. That would also be consistent with finding loose cartilage in the knee when they did the arthroscope. The good news about this procedure is it can be done on a not real invasive basis. Once the swelling goes down and some healing is evident Quentin can start his rehab exercises. Again I'm guessing, but I'd think he'd be ready to start rehab early next week, then work through 3 weeks of stabilization exercises, a week of extended spring training, and a week in the minors before returning to the big club. How does this impact the lineup? Well, it virtually guarantees Will Venable starting the season as your everyday RF. It likely means Jesus Guzman starts the year as the everyday LF. Venable has logged the most games in RF (7), and Guzman was second to Quentin in games played in LF, so far this spring (through Sunday's games). This is good, because it means Guzman's bat will be in the lineup every day the first 2 weeks of the season. You know, only the team's best hitter last season (by OPS+). The decision on how to keep his bat in the everyday lineup has been kicked down the road, and we'll look at that in a future post as well. 1. The Hardball Times article. Chris Jaffe sends out periodic emails with interesting factoids about the Padres. One of his recent posts was on the 10,000 anniversary of the 1984 NLCS Game 4, affectionately known as 'The Steve Garvey Game'. Worth the read if you have the time. Reds traded their farm system to get Mat Latos. Evaluation: GOOD. Like the acquisitions of Yonder Alonso and Yasmani Grandal, Brad Boxberger should be a horse out of the bullpen shortly, and if Edison Volquez can recapture his 2008 form what a steal he'd be. Signed Carlos Quentin for $7M. Evaluation: LIKELY GOOD. Quentin's power to left will play at Petco. His defense is somewhat questionable, and will likely limit him to LF, meaning Kyle Blanks and Jesus Guzman just got bumped. Signed Huston Street for 3 yrs/$22M 1yr/$7.5M. Evaluation: MEH PLUS. Street replaces the departed Heath Bell. I thought he was ancient but he's only 27 (turns 28 in August); it just SEEMS like he's been around forever. Street will not make anyone pine for Bell - he is a capable closer, having racked up 84 saves the last 3 years with Colorado - however I'd have preferred they spend that kind of money on another hitter vice a closer. UPDATE: Colorado is paying $500K of his salary this year and paid the $500K buyout of his option year for next year. 3. On 8 March the Padres agreed to terms with every player on the 40-man roster who did not yet have a 2012 contract in place, as well as a few other people. Cot's Baseball Contracts does not have 2012 contract details for most/all of them, so I'm making a wild assumption here, but I believe everyone signed for something around the league minimum (~$450K. I'd love to work for $450K sign me up to a league minimum deal). Here's the list - RHP Anthony Bass, Brad Brach, Andrew Cashner, Ernesto Frieri, Erik Hamren, Nick Vincent; LHP Jose De Paula, Cory Luebke, Juan Oramas, Josh Spence; IF Everth Cabrera, James Darnell, Logan Forsythe, Guzman, Andy Parrino, Edinson Rincon and Jeudy Valdes; OF Blanks, Rymer Liriano, and Blake Tekotte. I can't believe we have Guzman for the league minimum. 4. As spring training progresses (and as expected) the Padres are reassigning players in camp to other parts of their system. On 12 March they optioned Tekotte to AAA Tucson; Oramas, De Paula, Hamren, and Rincon to AA San Antonio; and Liriano to A Lake Elsinore. They also moved Robbie Erlin and Jason Hagerty to minor league camp. Last Friday Spence and Vincent were optioned to Tucson as well. Spence's option was surprising, although none of the other moves were. Spence threw 29 2/3 innings last year out of the 'pen, posting a 132 ERA+. He was spectacular after coming up and did taper off as the season progressed, but proved himself a usable part of the bullpen. His option-ing bodes well for Joe Thatcher's recovery from injury and readiness to start the season on the major league roster. I thought Bud Black would break camp with two LOOGYs. With Spence getting sent down that's not going to happen. 5. Then there's Carlos Quentin's knee surgery, but I hope to discuss that as its own post tomorrow. No game today; Pads will play 2 split-squad contests tomorrow. Information in this post was pulled from San Diego Padres press releases. As you no doubt have heard by now, yesterday San Diego Padres CEO Jeff Moorad withdrew his application to take control of the club. Tim Sullivan wrote a pretty good description of what's going on late yesterday afternoon, and it included some quotes from the Padres press release. The full release is below. The San Diego Padres today announced that Vice Chairman and CEO Jeff Moorad has withdrawn his application to Major League Baseball for a control transfer, in order to expedite MLB approval of the club’s television broadcasting agreement. The club will have no further comment until MLB completes its approval process. Yes it is just that short. And terse. There's a lot of intrigue associated with this development. First is the fact that apparently there's sufficient opposition to Moorad assuming control of the Padres to prevent Bud Selig from putting the transfer to a vote. According to published reports, Jerry Reinsdorf and Ken Kendrick are two of the owners putting up the most obstacles. It's as if because Moorad isn't a member of the Good Old Boys network he's not allowed to have a seat at the main table. It's not as if he's never owned part of a team - he was, as we all know, part-owner of the Diamondbacks. Could his exit from Arizona been so messy he made a permanent enemy of Kendrick? Was his negotiating style so caustic he made permanent enemies of 9 owners, who have Reinsdorf as the face of their discontent? And if his ownership was so galling why in the world did the owners allow Moorad to acquire 49% of the team in the first place? Seems odd. At first I thought the delay was solely because of Selig's desire for consensus - he is fairly well-known for liking unanimous votes on things. With 2 owners identified publicly as against Moorad's ownership, I thought Selig was just waiting for a chance to speak them privately and convince them to change their minds. Do the rogue owners have the votes to block Moorad's ownership outright? Can nothing Selig says change their position? That assumes Selig wants him as an owner. All the intrigue over the vote is on one side. Now one has to wonder if, in addition to the concerns about having the votes, if this delay isn't fall-out from the recent financial black eyes MLB has taken. Texas had to file for bankruptcy and be sold. Houston was sold for financial reasons as well. The Wilpons,owners of the Mets, got mixed up with Bernie Madoff and are walking the ragged edge of disaster. And then there's the soap opera in Los Angeles. Despite Moorad's statements to the contrary, there have also been persistent rumors he doesn't have the cash to pull this purchase off. MLB was under diligent in vetting Tom Hicks and Frank McCourt, so naturally the pendulum has now swung to over-conservatism in selling teams to new ownership - see the 9 month delay in finalizing the Astros sale, and now us. Approval of the TV deal San Diego has made with Fox was held up by MLB pending the transfer of ownership. It apparently was also held up due to concerns the up-front money Fox will pay the Padres would be used to pay off the other investors in the team vice funneled back into players and facilities. Moorad's removing his application for transfer means the TV deal can be approved, and since Moorad doesn't have the final say on where the money goes (one would think John Moores does) it likely won't be spent on reimbursements. Getting the TV deal finalized is a good thing, since the first spring training telecast is less than 10 days away. This little dance is far from over. At least Moorad has another 2 years to consummate the deal. Maybe he can convince his enemies he's not that bad a guy after all. Looking forward to lots of this over the next 6 years. In that uni would be a nice touch too. "Cameron has certainly emerged as a core player,” said Byrnes. “During his time with the Padres, he has impressed us with his play and with his character. He has shown us that he is committed to the Padres, and we are happy to secure his rights through 2017." Maybin, 24, enjoyed a breakout year in his first season with the Padres, establishing new career highs in nearly every offensive category, including games, runs, hits, doubles, triples, home runs, RBI and stolen bases, en route to being unanimously chosen as the Padres 2011 MVP by the San Diego Chapter of the BBWAA. He started 132 games in center field and led the team in runs, triples, stolen bases and multi-hit games. Terms of the agreement were not disclosed in the club announcement, other than to say the contract runs through 2016 and includes a mutual option for 2017. Thoughts: Maybin is seen as a core Padre going forward, and with good reason. He plays a premium defensive position well in a ballpark that requires athletic outfielders to cover it's spacious facilities. Last season Maybin's defense saved 11 runs (Dewan plus/minus) and placed him third amongst all MLB CF in that category. Not burdened by fear of management holding a quick hook if he didn't produce, he enjoyed his finest season at the plate, and became the 8th Padre to ever steal 40 bases in a season. The deal buys out all of Maybin's arbitration years, plus the first (and probably second) year he'd be eligible for free agency. Interestingly he's currently the lone player under contract for 2014, much less 2016. That piece of trivia notwithstanding this is an excellent move by the Padres. Now we an put whoever we want in LF and RF because Maybin can cover center from gap to gap. Update: The SDUT is reporting the deal as 5 years/$25 million, with the option year being worth $7 million if he returns in 2017. Maybin was worth 4.7 WAR (Fangraphs) in 2011 which equated to ~$21.1 million. If he plays at that level during this contract, Padres got him at a bargain price.